If commission sales drive your business, RepairDesk will drive your profits. We've designed a very simple yet effective functionality which allows you to manage employee commissions in a matter of clicks. How to set up commissions for employees? It's very easy. Let us show you how! 2. 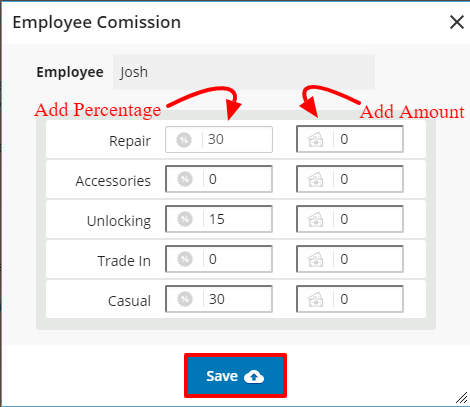 Under Employees in the left pane menu, select Employee Commissions. You will be able to see all of your employees with commissions for Repairs, Unlocking, Mobile, Accessories & Parts, Trade In and Casual items set against them. 3. 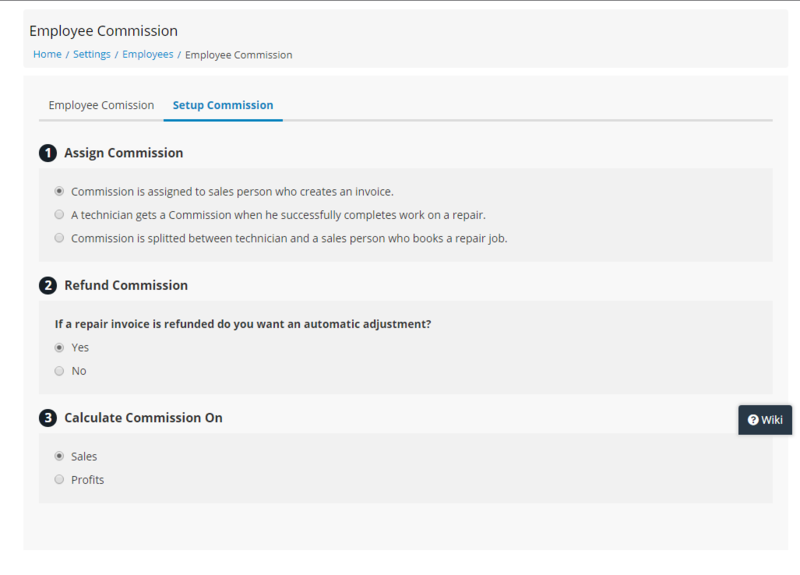 To set commissions for an employee, click on Action button and select Update. 4. Enter commission percentage and amount against different services and items for the employee. You can enter either % or amount. Click on the save button to update commissions and implement them. The commission can be set up against item category. 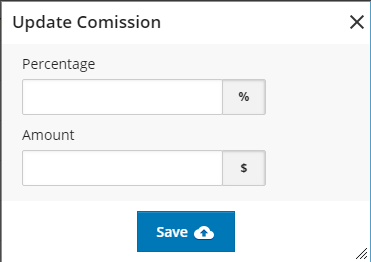 Commission can be either amount or it can be a percentage. A user can add commission for a particular category by clicking on the Action button and selecting add commission. You can add commission amount or percentage and press save. How can I set commission Item wise? 4. Click on save button to update repair service and implement changes. Note: Commissions on individual item take precedence over commissions assigned to category and employee. Like inventory items, you can set commissions for repair services, casual items and trade-in devices. There are some triggers in setup commission which should be set as per user choice that how he wants commission to be calculated for employees. 1. If the first trigger is on “commission is assigned to a sales person who created an invoice” it means that commission will only be assigned to salesperson. 2. If the second trigger is on “A technician gets a commission when he successfully completes work on repair” it means that commission will only be assigned to a technician when the repair will be marked completed and invoice is created for that repair. 3. If the third trigger is on “ Commission is split between technician and a salesperson who books a repair job” it means that commission will be assigned to both technician and sales person as per set in commission setup when a ticket is marked as repaired and invoice is paid. 1. If refund commission is YES, then if any invoice is refunded then commission assigned to an employee will be reverted back from his account. If the commission is paid to an employee and then the invoice is refunded after some time, system will create a negative balance against that employee. This negative balance will net off from the commission at the time of next payment. If the commission is not paid to employee and invoice is refunded, system will automatically remove that commission from its account. 2. If refund commission is NO, then if any invoice is refunded then commission assigned to employee will not revert back from his account. If commission is paid to employee and then invoice is refunded, it will have no effect on employee commission. If commission is not paid to employee and invoice is refunded, it will have no effect on employee commission. Commission will be calculated on the total sales price excluding tax. The commission will be calculated on the net profit. How much profit is calculated on sales can be checked through reports. And commission will be calculated on profit. Employee commission can be paid out through employee payroll report. All of the employee commission is accumulated in payroll along with his payroll amount. Once the commission is paid through payroll, it's status changes to paid in employee commission report. Q. How to set commissions on individual repairs? 1. Head to Inventory >> Manage Services >> Repairs. 2. Select a Repair Service. 4. Click on the save button to update repair service and implement changes. Note: Commissions on individual repairs take precedence over flat commissions assigned to employees. Like repair services, you can set commissions for accessories, mobiles, casual items and trade-in devices. Q. How to assign the commission to repair technician instead of an employee who created a ticket or completed a sales transaction? 1. Go to Employee Commissions settings. 2. Click on checkbox against the trigger "a technician gets commission when he successfully complete work on repair" to assign commission to employees who complete a repair job. Now commissions will only be assigned to employees who complete a repair job. Q. How to assign commissions to both the repair technician who completed the job and the employee who created the repair ticket? A. The commission is assigned when repair status is completed, repaired or repaired & collected and invoice is created for the same order. You can assign the commission to both the repair technician who completed the repair job as well as the employee who created invoice against this specific repair order. 1. going to Employee Commissions. Q. What will be functionality, if refund commission option is yes? A. In case refund commission is yes if any invoice is refunded then commission associated to that invoice will also revert back from employee account. Either it’s paid or not. If the commission is paid to employee and invoice is refunded then a negative balance will stand against that employee which will be settled from further commission complied against that employee. Q. What will be functionality, if refund commission option is No? A. In case refund option is No, then in case of invoice refund, no commission will be reverted back from the employee account. Q. How individual employee can check his commission? A. Employee can see his commission by clicking on my commission from shown window. It will have breakdown category wise. Clicking on My commission will redirect the user to report where he can see commission. Q. How can I void employee commission? A. In order to void commission go to Employee commission report, here commission is calculated as per invoice, if you want to void a commission either its paid to the employee or not you can Void it. Under the action button, there is an option to void, once you have voided the commission there is no reverting back. That commission will be removed from employee account. If the commission is already paid to employee and admin voids that commission system will create negative entry against that employee which will be deducted from employee commission. You can also multi-select invoices and mark make them void. In case the commission is voided, that commission will move out of employee account, but they will display here in the report. Q. How commission will be assigned in case of In-house ticket transfer? A. in case of in-house ticket transfer, if commission is set that technician will get commission after repair job is done trigger is on. If you transfer the ticket to store 2 and technician repair ticket and send back that ticket to store 1, and invoice is made at store one, commission will be given to store 2 employee who has repaired the ticket. Note:In case of in house ticket transfer it is mandatory to make invoice on parent store so that commission can be assigned to respective employee, if you don’t follow this procedure then commission calculation will be disturbed. Q. How commission will be assigned in case of physical transfer of ticket? A. In case of physical transfer when the ticket is transferred to other stores, the commission will be calculated as per trigger set on that store. Note: In case of physical transfer, the invoice should not be attached to transferred ticket. Otherwise, it will disturb commission calculation. Q. How commission is calculated when overall discount is applied to invoice? A. In case of overall discount, commission will be calculated on the invoice amount without discount. Q. 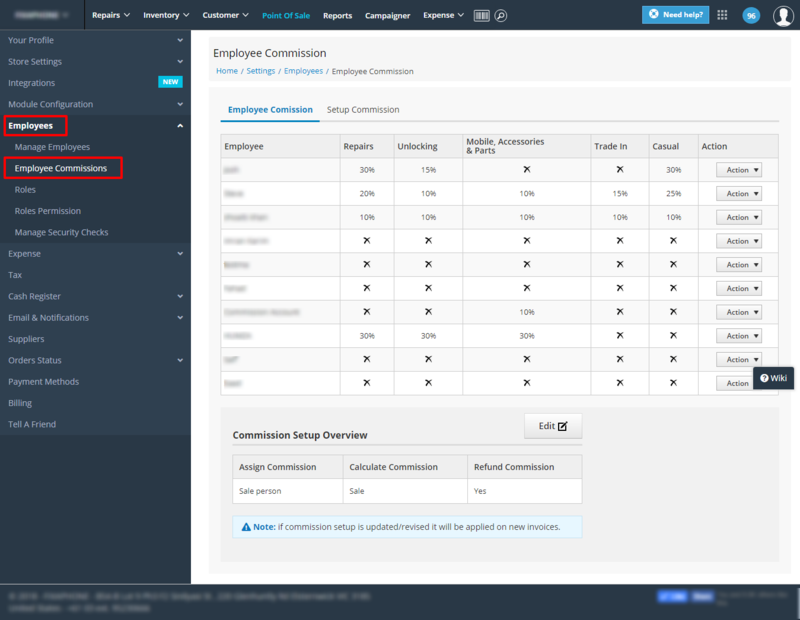 How employee commission is displayed on reports? if the commission is set against any of these attributes then it will be calculated and shown in reports otherwise no commission will be shown against any employee in reports. Q.In case of refund invoice what will be the impact on employee commission? A. If refund commission trigger is off then there will be no impact on employee commissions. if refund commission trigger is On then, in case of partial refund of invoice, the commission will be removed from employee account for that particular invoice.